In her Pinterest profile, Erika Barker describes herself as a New York fashion and portrait photographer, veteran combat photojournalist, visual storyteller, Photoshop warrior, and public relations ninja. Creative professionals like Erika are well served on this highly visual social media website. On her Pinterest pages, she shares her amazing portraits and other images. 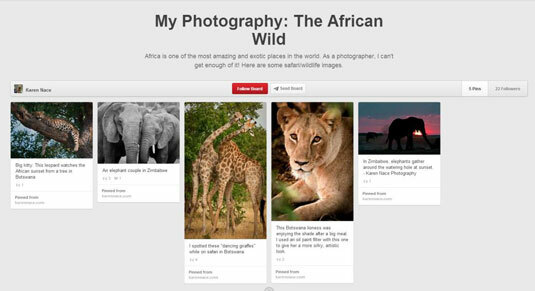 Photographer Karen Nace has set up a Pinterest board to showcase her African wildlife photography. To view more of Karen’s photographs from all over the world, visit her website. Some Pinterest users focus on a specialty or category, such as animals; others post a more varied collection of images. You can set up as many boards as you like on Pinterest and use them to organize your own images or images that you get from the web. Melanie Duncan describes herself in her Pinterest profile as a Serial Entrepreneuress, business mentor, and style lover. She teaches courses in how to use Pinterest more successfully, and she’s active across many social media sites, with more than 100,000 Likes on Facebook and multiple websites, including. Beautiful family portraits adorn the pages of photographer Diana Barbatti’s Pinterest profile. Showcasing boards that follow her passion for fashion, interior design, and great imagery, Diana uses Pinterest to invite friends and potential photography clients to her website. San Francisco–based photographer Kelly Vorves has lots of great images to share on Pinterest. She showcases her portraits and other photographs, as well as pins about fashion and her other passions.